Technology in the kitchen – What will be in the kitchen of the future? It’s painful to admit, but the recipe book is dying a death. These days we whip up our favourite curry while reading the instructions from our tiny smartphone screen. The way we use our kitchens and cook our food is changing rapidly. But what is the next step? Kitchens are rapidly evolving to become fully interactive and online, and kitchen technology is getting more advanced every year, with a large focus on cutting down on waste and helping customers watch their waistlines. Here we look at some of the gadgets that may become commonplace in the kitchen of the future. In 2013, Whirlpool revealed an amazing ‘interactive cooktop’ that used projection and hologram technology that seemed to come straight out of a science fiction film (think Minority Report in your kitchen!). 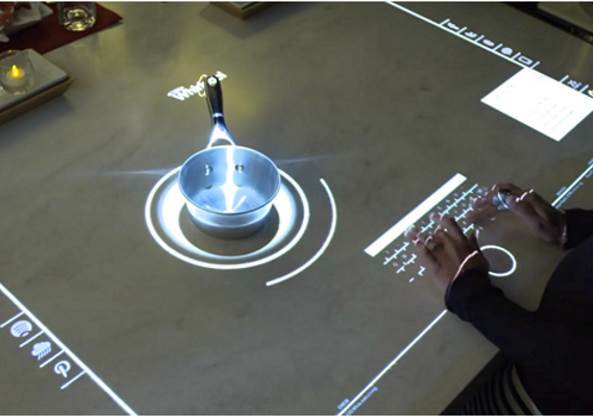 Now you can create a stove on any worktop and bring up your online recipe to read and follow straight off a hologram projected onto your work surface without fear of getting food splashes all over your technology. Pretty neat, huh? The Nutrima, a roll out matt that acts as a set of scales, can tell you the exact weight and nutritional value of everything you put into your dinner, helping you make sure you keep within your daily calorie intake. This technology has also been put inside interactive chopping boards that may become commonplace in the kitchen of the future. The technology even applies to your cutlery. An electronic fork called the HAPIfork has been designed and programmed to tell you how much you are eating and how quickly – the smart way to control your portions and prevent you from gulping down your dinner. Smart fridges are also a new way to control our food waste- they have the ability to scan your food’s barcodes and let you set the use by date so your fridge can warn you when something is close to going off – no more gruesome mouldy discoveries in the back of the fridge! Some smart fridges will even suggest recipes based on the food stored inside your fridge, meaning using up all your ‘bits and bobs’ in new and imaginative ways! A lot of kitchen technology now also incorporates our smartphones into our lives. The MilkMaid for example is a new piece of technology that has replaced the humble milk jug. The MilkMaid can send messages to your phone when what it contains is about to go off – we’re not sure if it’s as reliable as the ‘sniff test’ but still pretty snazzy! All this seems small fry when it comes to the ultimate in food technology – food printers! But don’t get too excited yet, food printers are still in the early stages and are currently being developed to help feed astronauts first before they turn up in your kitchen! What do you think? Is this new technology set to improve our lives, or do you long for the days of a splatter covered cook book and a set of brass scales?